GSMArena team, 8 April, 2015. Another Chinese flagship but with a twist. If vivo rings a bell at all, it's most probably the X5Max, the world's slimmest phone. Not a bad thing to be known for but vivo isn't just about looks. 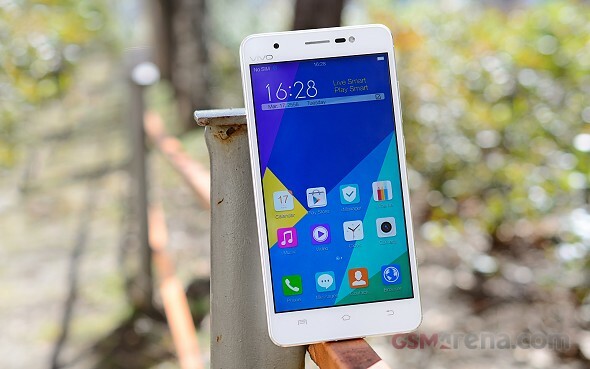 This Chinese maker isn't a discounter either - vivo is more like Oppo, less like Xiaomi. It is a limited lineup where most of the recent models do stand out in one way or another, helping vivo build a reputation as a premium phone manufacturer. vivo is known for experimenting with imaging and audio technology and using components that you don't get every day in phones made in China. The vivo Xplay3S was cheered by audiophiles and the Xshot we're about to review is a flagship cameraphone. The vivo Xshot is an exquisitely built phone with premium finish, formidable specs and a camera setup which almost puts it in a league of its own. The vivo Xshot is available in two versions. One is powered by a Qualcomm Snapdragon 801 SoC, with four CPU cores clocked at 2.3 GHz, 3GB of RAM and 32GB of storage. The other, lighter version packs a Snapdragon 800, 2GB of RAM and 16GB of inbuilt memory. Other than that, the two handsets are identical. Both variants are typical 2014 flagships - which isn't necessarily a criticism. After all, the vivo Xshot was released last summer. Similar to a Samsung Galaxy Note 3, with a duly adjusted price. Quad-core Qualcomm MSM8974AA Snapdragon 801 or Snapdragon 800 at 2.3 GHz, 2/3 GB RAM and Adreno 330 GPU. 13MP camera with 4K video, OIS, f/1.8 and dual-tone flash; 8MP, wide (84 degree) front-facing camera with LED flash and 720p video. Dedicated two-stage camera shutter button. Graphics are courtesy of Adreno 330, so quite a lot of computing power there as well. The Xshot is equipped with a 5.2-inch IPS LCD panel, of Full HD resolution and 424ppi. It is sharp and clear, but quite reflective at times. The camera setup though is undoubtedly the main entry on the specs sheet. The Xshot packs an ambitious 13MP sensor, complete with a f/1.8 aperture, optical image stabilization and 4K video recording capabilities. This one should be able impress at low-light shots and we can't wait to take it out for a spin. The front-facing shooter is very nice as well at 8MP and it even has its own dedicated LED flash, so selfies should also come out quite nice as well. The vivo Xshot is a single-SIM LTE-enabled smartphone. It runs what is technically Android, but about as custom as it gets. vivo's own custom version of Android is called Funtouch OS. The version is 1.2 and is based on Android 4.3, so there is definitely room for improvement there. Other than that, the GUI is really gorgeous and clean with a distinct Apple vibe, but not too much, like we've seen in so many other Chinese phones. vivo has thrown in a few nice air gestures and a timeline of user interactions, but there are still some rough edges to polish.